I haven’t posted about books I’ve been reading for a while, partly because much of it has been the rereading I do for teaching. And since classes ended, I’ve continued in my rereading of some favourite books. 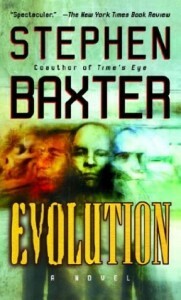 Just this morning I finished Evolution by Stephen Baxter, a novel that is the epitome of nerd crack. Basically, the novel is the story of human DNA: from the first rodent-like primates running around under the feet of the dinosaurs, to homo erectus, to Neanderthals, to homo sapiens … and then speculating millions of years into the future as to where we’re going. Spoiler alert: we don’t become balls of pure energy as Gene Roddenberry suggested. The novel is part interlinked short stories interspersed across millions of years, and part extended lecture on evolutionary biology. If you’re the kind of reader who hates novels that explicitly try to teach you something, take a pass. But if you’re like me and love a good story that also offers tons of cool facts, well … like I said, nerd crack. The story begins with Purga (from purgatorius, one of the first species of primates), and her anxious life at the feet of the dinosaurs. More importantly, Purga lives through the comet-strike that resulted in the mass extinction of the great saurians. The description of the comet hitting the earth, and the effect it had, is really worth the price of admission: while Baxter’s prose is mostly serviceable, here he attains a certain brutal lyrical elegance. The impact had sent an energy pulse through the body of the earth. In North and South America, across thousands of kilometers, faults gaped and landslides crashed, as the shocked ground shuddered. The rocky waves weakened as they propagated, but the Earth’s internal layers acted like a giant lens to refocus the seismic energy at the impact’s antipode, the southwestern Pacific. Even here, the width of the planet away, the ocean floor heaved in swells ten times higher than the 1906 San Francisco earthquake. The shock waves would continue to pass through the planet’s body, crossing, interfering, reinforcing. For days, the Earth would ring like a bell. If the novel has a flaw, it’s that it tends to be repetitive. Certain tenets of evolutionary theory are narrated again and again, and Baxter never misses an opportunity to remind us of the cruel, cold calculus that is survival of the fittest. Aside from this occasional didactic tendency, however, the novel manages to tell the story of evolution with almost a potboiler-level of immediacy—no mean feat, considering that each chapter introduces new characters and new settings that necessitate a whole lot of exposition and mental adjustment on the reader’s part to animals and landscapes literally reshaped and reinvented by time. The narrative’s principal pivot-point balances on the story of a pregnant paleontologist (try saying that five times fast) named Joan Useb who, with the assistance of her friend Alyce Sigurdardottir—a biologist—has organized a huge conference of scientists of varying disciplines in (appropriately) Darwin Australia. The year is 2031, and all the global problems of our present day—climate change, wealth inequality, rapacious corporate culture, dwindling natural resources—have only gotten worse. Much worse, to the point that Joan and Alyce have an ulterior motive for organizing the conference: to bring together the best scientific minds in the world and bang out a manifesto for how to arrest and reverse the global descent into crisis. It’s a Hail Mary play, but we never get a chance to find out if it will work. The conference is attacked by a group of fundamentalist fanatics just as a massive volcano in Papua New Guinea explodes and pushes the planet’s fragile climate past the point of no return. Why not? Birds lose flight all the time. To be smart costs. Even a brain the size of yours is expensive; it eats a lot of energy from your body’s supply. Maybe this isn’t a world where being smart pays off as much as, say, being able to run fast or see sharply. It probably didn’t take much rewiring for language, even consciousness, to be shut down. And now the brains are free to shrink. Give them a hundred thousand years, and they’ll look like australopithecines. The “cost” of intelligence in evolutionary terms is another of the points Baxter hammers home repeatedly, describing the evolutionary steps that made intelligence and language advantageous and the concomitant difficulties it posed our genetic ancestors: the inability to breed prolifically, for example, or the necessary helplessness of human infants. Other species’ offspring are vulnerable but emerge with all their faculties intact; deer and horses can walk, turtles can swim, and so forth. Given a lack of predation, they can fend for themselves, whereas a human baby simply cannot. The reason, Baxter points out, is because our brains are incomplete when we’re born. If they weren’t, we simply wouldn’t fit through the birth canal. Human beings, in effect, continue to gestate for several years after birth. The devolution of humanity, which comprises the final three chapters, is one of the most remarkable elements of the book for the simple reason that it challenges the tacit assumption of progress, that evolution inevitably describes an upward arc. The soldier who commented on the brain’s energy cost also points out, when his commander declares his intention to rebuild civilization, that there is nothing to build with—all of the easily accessible natural resources that made civilization possible have been used up. One of my favourite chapters in the novel—the last historical one before the ill-fated conference—takes place in CE 482, in the midst of the ruins of the Roman Empire. It details a Roman named Honorius’ fascination with old bones. He has traveled widely, collecting a mishmash of fossils, dinosaur bones, and pre-human skulls. Honorius is sort of a proto-Darwin, slowly piecing together an understanding of a much more ancient past than ever previously imagined, out of which humans emerged. But he never has a chance to be Darwin, as he is murdered in a power struggle between Romans and local Gallic nobles. There came a point of diminishing returns, in which every denarius collected in taxes was pumped into administrative maintenance and the military. The empire became increasingly complex and bureaucratic—and so even more expensive to run—and inequality of wealth became grotesque. By the time of Nero in the first century, all the land from the Rhine to the Euphrates was owned by just two thousand obscenely rich individuals. Tax evasion among the wealthy became endemic, and the increasing cost of propping up the empire fell ever more heavily on the poor. The old middle class—once the backbone of the empire—declined, bled by taxes and squeezed out from above and below. The empire consumed itself from within. I said this was one of my favourite chapters; I didn’t claim it was subtle. The Roman with Darwinian thoughts is really just an excuse to use the fall of Rome as an object lesson. Rome fell and plunged Europe into the dark ages, but civilization was ultimately rebuilt. One of the novel’s central messages is that, as a species, we won’t have that opportunity. Roman civilization crumbled, but was preserved piecemeal in the east; the Renaissance was to a large extent its rediscovery, and that historical drama of fall and rise was played out in a small section of the globe, having no direct effect beyond the former extent of the empire. Evolution reminds us that any collapse now would necessarily be total, global, and we will lack the resources for anything resembling a reconstruction of the world as we know it. As enjoyable a read as it is, Evolution is a deeply depressing novel, both for its bleak outlook and for the way in which our current existence is rendered utterly insignificant when viewed on a geological time line. It makes the appeal of creationism somewhat more understandable, as a six thousand year old world made specifically for humanity is a far more comforting prospect than the mind-numbing swath of years depicted in Evolution. Yesterday I watched a documentary on HBO called Challenging Darwin, which looks at creationism in contrast to Darwin’s life and his gradual distancing of himself from his faith, which had been strong enough early in his life to consider a career in the clergy. The documentary itself is forgettable; what I came away from it with was a depressing sense of just how incommensurable these two discourses are. Creationism begins and ends with the Bible, full stop. One of the evangelicals interviewed proudly declared that “if the Bible said two plus two equaled five,” he would have to adopt his understanding of math to conform. But what a lot of the creationists maintained is that they simply cannot accept the idea that the universe was not made specifically for them; again and again they express the belief that everything is meant to be and everything has meaning as part of God’s plan, and that our presence on the earth is not transient but immortal. They really ought to read Evolution.